"Do you want the leftover last night for lunch?" I asked my son when he got home early from school. I had made something with beef for our dinner the night prior and approximately one more serving was left. "Don't throw it away," I cautioned my two boys who ate a little later than me. My son preferred the salad so I warmed up the beef and ate it with a little bit of rice. After cleaning up and as I sat down, I felt my eyelids became droopy until I couldn't fight the weariness from having lack of sleep last night. My son was studying until the clock hit a few minutes after midnight. I could hear him so I was tossing and turning. Not that he was noisy. I think it was because I was feeling sorry knowing how hard his classes were. "Rest for now!" I warned him after taking the last bit of morsel from his lunch. His rest meant doing something lighter in advance so he could get done with a project for his French class. There I was, dreaming in the mid of the day, sitting comfortably in the recliner upstairs. I surrendered to the aching desire to doze off for a little while after days of waking up so early, preparing sack lunches for my husband who would always leave way early every weekdays. My husband's call advising me he was on his way home interrupted my nap. Though I sounded dazed to him, I felt a sense of renewal with my strength. "There is balance with the LORD," I reminded my son. "There is a time to work hard but it's also important to rest other times." Jesus had shown how our spiritual lives needed refreshment from Him. 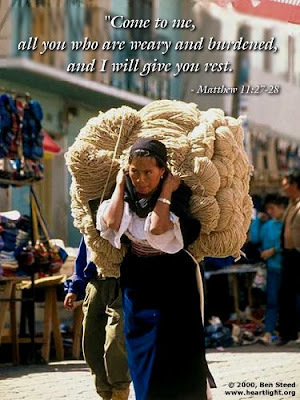 He offers rest to those who are weary. (Then Jesus said, "Come to me, all of you who are weary and carry heavy burdens, and I will give you rest. - Matthew 11:28 NLT). In Jesus, we can learn to be content because He is our All-in-All. No one is ever turned away who desire to draw near Him. He can give everything that we need. Yet, with all of His bountiful blessings, it is good to learn not to throw away those extras that we don't need as many are in want. Who knows...What could have been thrown away now might be needed sometime in our future?